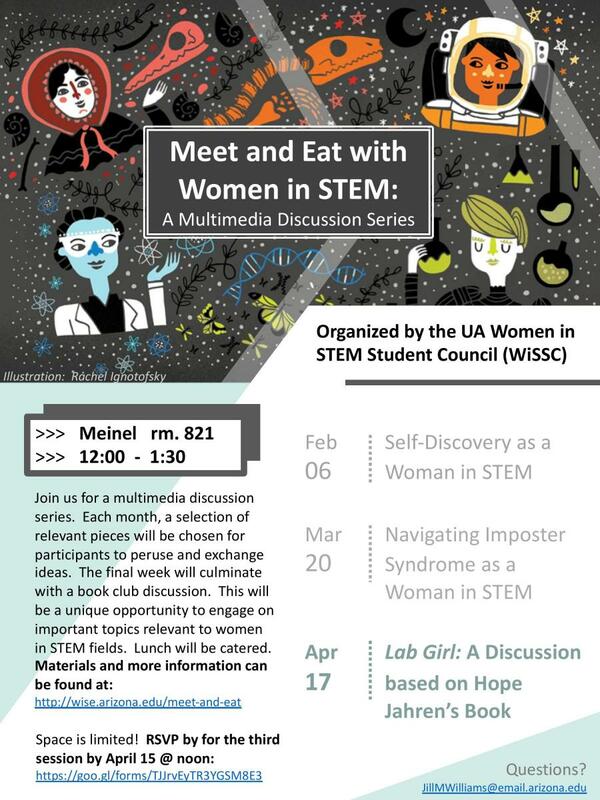 Come meet other women in STEM and allies and discuss topics relevant to female students pursuing STEM fields. And have lunch too! See the discussion topics below and RSVP to let us know if you're coming. Information on the materials that we'll be discussing will be emailed to those who rsvp at least one week before the discussion. Hope Jahren is a world reknown earth scientist who has held academic appointments through the US and in Europe. Her memoire, Lab Girl, traces her journey through the sciences from her childhood growing up in rural Minnesota, graduate school in California, and the challenges of establishing herself as a young female academic in a field where there are not many women. Jahren's reflections on her movement through academia bring up a number of important issues including mental health, securing and sustaining funding, and how to establish and manage relationships with colleagues and loved ones in the midst of career ups and downs. Excerpts from the book can be found HERE and will be shared at the event so that even those unable to read the book will be able to participate in the discussion. *Free copies of the book are available to borrow! Contact Jill at JillMWilliams@email.arizona.edu to obtain one.